Pure racer with MM2 motor case delivers huge increase in corner speed! 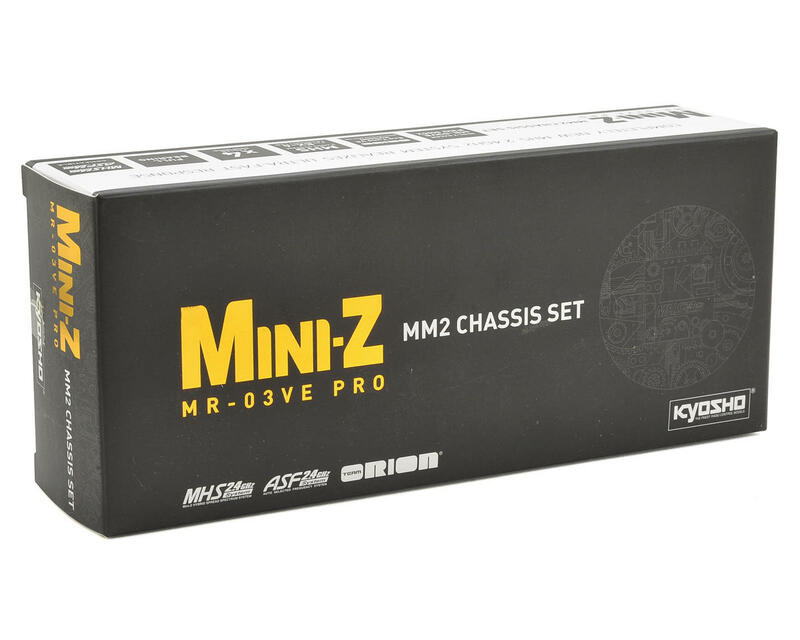 The Kyosho MR-03VE Mini-Z PRO Brushless Chassis Set is ideal for JSCC class racers in the MINI-Z Cup. This prebuilt chassis provides the ultrafast response of the MHS 2.4GHz system - its 16 times faster than the previous ASF 2.4GHz system + KT-18 transmitter combination and 4 times faster than the ASF 2.4GHz system + KO PROPO EX-1 combination! With its performance defining midship motor mount, the MM2 motor case allows the longer (94mm) wheelbase to be used. The existing MM motor case design can be used with the LL (98mm), 3L (102mm) and 4L (106mm) wheelbases, but the MM2 motor case can be used with L, LL and 3L wheelbases. Also, compared to the existing RM motor case, mass balance is optimized to improve cornering performance and minimize tipping due to high side on hybrid surfaces. These performance features provide a huge advantage in the JSCC class with the narrow body required by the regulations. In addition, axle adjustment spacers allow changes to the rear axle shaft height and together with the new plastic friction shock, precision setting according to road surface conditions are possible. The benefits of the MM2 motor case combine with the ultra-responsiveness of the MHS2.4GHz system in the advanced MR-03VE PRO chassis for psychokinetic-like response and a linear control feeling that realizes the ultimate goal of improved lap times. Enables mid motor mount with L wheelbase. Cornering performance limits are lifted and tipping from high side is dramatically reduced. Can be adjusted to 3 different levels with rear axle height adjustment spacers that allow setup to be optimized according to road surface conditions. Redesigned shock absorbs movement from all directions in the rear suspension to deliver increased driving stability. Essential in a true racer and is installed as standard. Realizes smooth differential and high speed cornering performance. Equipped with the sufficiently powerful proven Xspeed VE ECO Tune brushless motor (5600KV). Realizes 4-times the response speed compared to ASF 2.4GHz system + KO PROPO EX-1 combination. Response speed and linear controllability contribute to faster lap times. Ultrafast response of the MHS 2.4GHz system can only be realized in combination with the optional Syncro EX-6. When used with the KT-18 transmitter, specifications revert to conventional ASF 2.4GHz system. 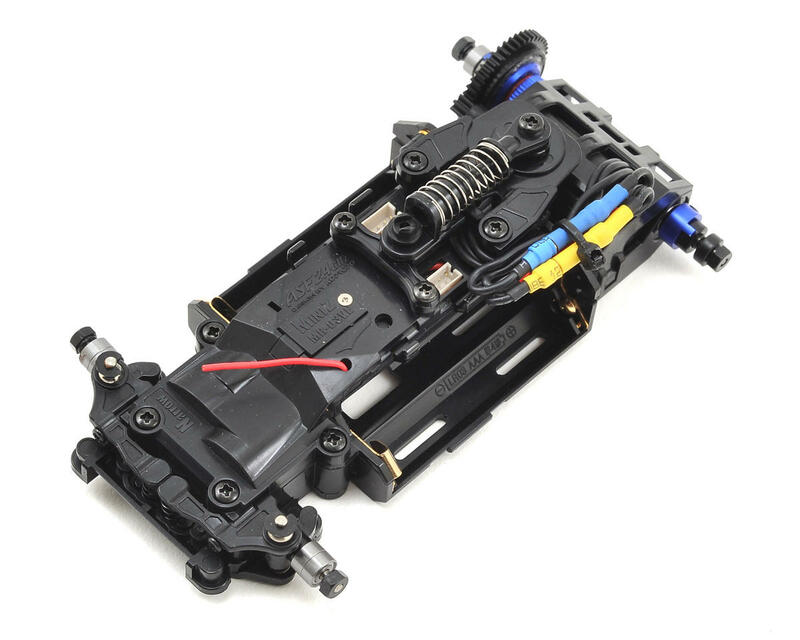 MR-03 chassis set installed with brushless motor enables mid motor mount with L wheelbase. Rear axle shaft height can be changed with axle adjustment spacers. Equipped with redesigned plastic friction shock as standard. MHS 2.4GHz system delivers the fastest control response in MINI-Z history. Features full ball bearings, ball diff (blue anodized), and gold plated battery terminal specifications. Unique front suspension (VCS) changes camber in accordance with suspension stroke. Compatible with ASF 2.4GHz system. **Transmitter sold separately. Equipped with digital servo incorporating coreless motor. ASF 2.4GHz transmitter KT-18, or MHS 2.4GHZ transmitter EX-6 *If using MINI-Z HYBRID SPREAD SYSTEM (MHS), requires compatible transmitter.